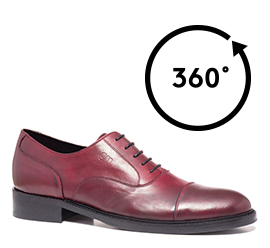 Elevator dress shoes made of burgundy Tuscan calfskin leather, patiently buffered by hand to obtain a refined vintage effect. A timeless oxford shoe with a rounded shape characterized by the balance of the lines and the quality of the leather and materials used. Thanks to its anatomicity, the inner elevator system ensures maximum comfort even with 3.1 inches increasers. Ideal to complement a casual-chic look.